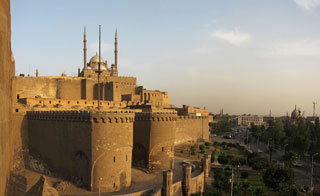 The Saladin Citadel of Cairo is a medieval Islamic fortification in Cairo, Egypt. The location, on Mokattam hill near the center of Cairo, was once famous for its fresh breeze and grand views of the city. It is now a preserved historic site, with mosques and museums. This article uses material from the Wikipedia article "Saladin Citadel of Cairo", which is released under the Creative Commons Attribution-Share-Alike 3.0 License.